Lilabelle Lane: Can you help? Some regular followers of my blog may remember a post I made back HERE about the sad loss of my brother-in-law. Waine battled all of his adult life with depression. Glenn, Waines brother and my much loved man is taking part this year in Movember. Movember helps raise awareness for Men's Health issues including depression. Glenn is normally a quiet guy but this is a cause that his close to his heart and as such he has asked me to ask for your help to support this worthy cause. If you can spare just a couple of dollars to help support this truly worthy cause and in turn support ALL THE MEN in all our lives it would be so greatly appreciated. Donations don't need to be large. Every $5 helps ......... Can you help? You can click on this picture below to be taken to Glenn's Official November site. 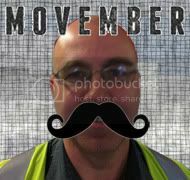 A link to Glenn's Movember page will remain on the side bar of my Blog for the month of November. Please remember, every dollar helps this worth wile cause. Since its humble beginnings in Melbourne Australia, Movember has grown to become a truly global movement inspiring more than 1.1 Million Mo Bros and Mo Sistas to participate, with formal campaigns in Australia, New Zealand, the US, Canada, the UK, Finland, the Netherlands, Spain, South Africa and Ireland. In addition, Movember is aware of Mo Bros and Mo Sistas supporting the campaign and men’s health cause right across the globe, from Russia to Dubai, Hong Kong to Antarctica, Rio de Janeiro to Mumbai, and everywhere in between. No matter the country or city, Movember will continue to work to change established habits and attitudes men have about their health, to educate men about the health risks they face, getting them to act on that knowledge, thereby increasing the chances of early detection, diagnosis and effective treatment. In 2010, over 130,000 Australian Mo Bros and Sistas got on board, raising $25 Million AUD. The Movember Effect: Awareness & Education, Survivorship, ResearchThe funds raised in Australia support equally the two biggest health issues men face – prostate cancer and depression. The funds raised are directed to programs run directly by Movember and our men’s health partners, the Prostate Cancer Foundation of Australia and beyondblue: the national depression initiative. Together, the three channels work together to ensure that Movember funds are supporting a broad range of innovative, world-class programs in line with our strategic goals, in the areas of awareness and education, survivorship and research. And look ..... Bendigo has chanced its name for No Movember to Bendimo!!!! Thank you for your support and I hope to be back tomorrow with some weekend stitching (although a little slow) progress. I also support my son-in-law with this cause but i wish you and Glenn well,it is a great cause.